How my '10 vegetables to plant now' worked out in practice. 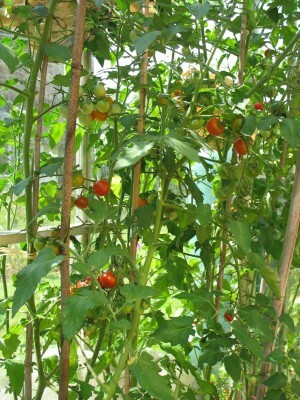 In my May post, I gave ’10 vegetables to plant now’. Here’s how they’ve progressed in my garden, as well as suggestions for what to plant now (late July/early August). Courgette ‘Best of British’ – these germinated well. I ended up with two plants (when I do more I can’t cope with the glut of courgettes) of which one is in full sun and is producing rather hard deep green courgettes. It’s been so dry – I have been watering them but they obviously need more. Glad to have had some downpour last night. Courgette ‘Rugosa Friulina’ – I don’t know where this one went! I thought I had one but the slugs must have got it when I ran out of pellets (wildlife friendly from the Organic Gardening Catalogue). I used non-wildlife friendly ones briefly, and a vast amount of dead creatures appeared, which I had to hide quickly so birds wouldn’t eat them. The advantage of the OGC one is that it makes the slugs burrow into the ground, so birds aren’t likely to get them, as well as it being a less toxic substance. 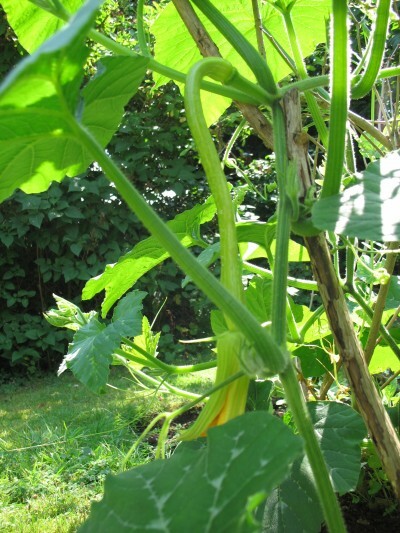 July planting for autumn eating: I have planted some more courgettes now – my calendar suggested to sow more in the last week of July, as well as lettuce, chard, fennel and French beans. I’ve also sown some more chard and lettuce following this advice; the courgettes have germinated already. Rocket, mizuna and other oriental greens will grow from now onwards, as well. This is rampant – I have kept it down to one plant and am propping it up on the pea sticks as the bed is quite small. 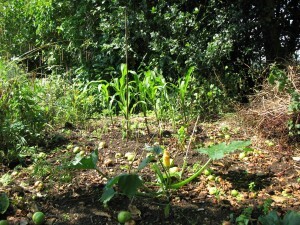 Small squashes now appearing: in the photo, the squash is the long pale green stem-like shape in the middle. Parsley ‘Big Mountain’ – no show. I’ve sown some more and am waiting… Will buy Thompson and Morgan’s substitute for this, ‘Lisette’, for next year as I think my seeds were too old to germinate. Lettuce ‘Paris Island Cos’ – great one, I’ve had some lovely lettuces from this. Also the old packet of ‘All the Year Round’ produced good butterhead lettuces and it was very easy to grow. ‘Gardener’s Delight’ – Doing very well. It must have been the ‘Tomato ‘Bottom of the bag’ seed. Small, red, very tangy intense delicious taste you never get from bought tomatoes, and roasts to a more sweet taste. Tomato ‘Golden Sunrise’ – Lovely little orange tomatoes, slightly mellower than Gardener’s Delight. Tomato ‘Sungella’ – I have just started harvesting this one – it is mellow and sweet and slightly bigger – golf-ball size – than the other two. Climbing French bean ‘Mr Fearns’ – I’ve had a few of these now, they are as wonderful as ever. Runner Bean ‘Lady Di’ – going really well, I cut them early when they are really tender and you do not have to string them. Multi-coloured sweetcorn and ‘ordinary’ Kelvedon Glory sweetcorn – I am growing them near a large apple tree as an experiment. There is sun in the morning, but the corn is not as high as it would be if in full sun, so I’m not going to repeat this next time. I’ve also planted some Rainbow Chard here too and have only 5 plants soldiering on – thought they could take the shade, but cats, moles and falling apples have taken a toll on them despite me replanting dug-up chard asap and sticking little sticks all around it (too late). Asparagus kale. This goes like the clappers! I have a lot of it, and ate so much I left the rest to the caterpillars in July, who swiftly decimated it. Am going to cut it down and hope for a little more, then leave it till next year for the stems. The kale soup was good after a large sugary afternoon tea I had for my birthday. As well as these I have had some garlic (no particular variety, I save a few heads each year) and a lot of broad beans. They’ve done very well this year – ‘Aquadulce’ and ‘Bunyard’s Exhibition’. I recommend both garlic and broad beans as easy starter veg, as well as lettuces. Eating your own lettuces is very good for the morale of a gardener I think – I still can’t believe my cos lettuces have been grown by me, they look so ..perfect.